It's hard to believe that a cupcake can be made with only four ingredients. 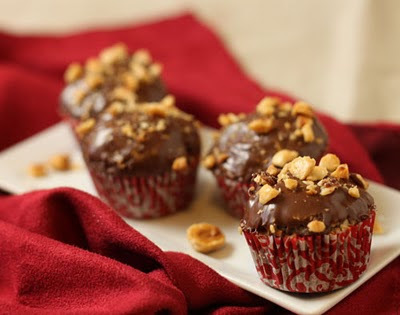 And technically, these cupcakes can be made with only three ingredients (if you don't add the chopped hazelnuts on top). Cake or Death posted this recipe for Four-Ingredient Nutella Cupcakes using Nutella, an egg, flour, and hazelnuts. I have all of these ingredients. I could make these right now. But then I'd have to eat them all. Darn. 1. Heat the oven to 350 degrees. Line 9 cups of a mini muffin pan with paper or foil liners. 2. Put 1/2 cup of the Nutella and egg in a medium bowl and whisk until smooth and well blended. Add the flour and whisk until blended. 3. Spoon the batter into the prepared muffin tins (about 3/4 full) and bake until a pick comes out with wet, gooey crumbs, 11 to 12 minutes. Don't overbake! 4. Set on a rack to cool completely. Once cool, warm the remaining 1/2 cup of Nutella in a small bowl in the microwave just until warm and fluid, about 15-25 seconds. Dip the tops of each cupcake in the Nutella, so that it's completely coated. (You will have extra Nutella left over. I trust you can find something to do with this.) Sprinkle the tops of the cupcakes with the chopped hazelnuts. These keep for up to 3-4 days in an airtight container at room temperature. Yum! You had me at Nutella. These sound to die for. I will have to try making these soon. Especially because they are so easy. Thanks! Man, three ingredients? That is dangerously easy. And since they use Nutella, can I eat cupcakes for breakfast? I eat cupcakes for breakfast all the time. These are dangerous because they are so easy to make and most people have the ingredients already. Enjoy!